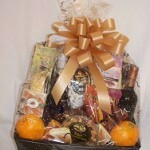 Customized gourmet gift baskets designed and hand delivered in Las Vegas. 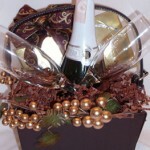 Gourmet your way basket makes a beautiful statement for any occasion. 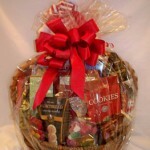 Two bottles of fine wine spice up any celebration, while a large assortment of treats – including raspberry cookies, biscotti, buttery caramel corn – ensures a yummy sweet or savory snack with the wine. 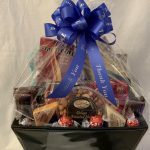 The tasteful leatherette container is filled with goodies, covered with cellophane wrap and tied with a lovely color-coordinated hand-tied ribbon. 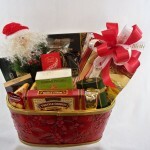 Includes a message card to convey your kind wishes. Large leatherette file box filled with 2 bottles of fine wine, 4 oz cheddar and 3.75 Havarti Dill cheese spread, assorted Partners crackers, Columbian coffee, 2 gourmet biscotti, 3oz raspberry cookies, 3 oz cinnamon pecans, 5 oz mango snack mix, fresh oranges, buttery caramel corn, 15 piece box chocolate truffles, 8 oz frosted pretzels, 4 oz assorted mixed nuts, holiday jellied candies. 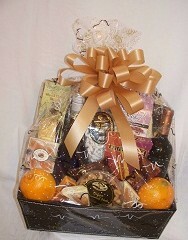 Cello wrap, hand tied bow and message card.